I like to paint figures and objects in a mysterious nature and sometimes in a flat textured background in dramatic ways .I like to work out detailed finish brushing similar to a photo realistic technique. My paintings evoke mysterious, spiritual and surreal feelings. I was born in Assam, Guwahati on 01/10/1984. 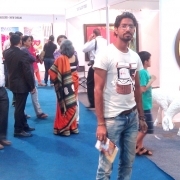 I graduated in first class with B.F.A from Indian College of Arts and Draftsmanship, in Kolkata in the year 2008. After I completed my B.F.A , I went to Pune for a PG Diploma from the Film And Television Institute Of India, Pune later that year. I graduated the post diploma Art direction and Production Design course from (FTII) in the year 2011.